I'm always recruited (offerbecauseilovedoingit) to make card whenever our department needs to give a card to someone at work. Here is the card I did for a co-worker's baby shower. 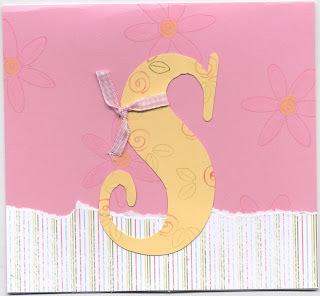 Monograms on cards and scrapbook pages are really popular right now. The baby's first name is going to start with an S, so I thought it would be cute to make that the focal point of the card. I love using chipboard letters, but I didn't have an extra S laying around, so I made it myself.I know there are many ways to do this, but here's the way I do it. First, open a new document in Microsoft Word. Chose: Insert>Picture>WordArt. It will then prompt you to choose your WordArt style. I usually choose that first option - the outlined letters. The next step is to choose a font that is large without too many intricate details - you are going to be cutting it out and you don't need to mess with that! Arial is a good basic choice. Hello! I wanted to invite you to the first of hopefully many mini classes I will be hosting occassionally! I will be teaching the fun and functional One Sheet Wonder technique. 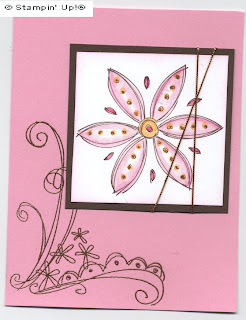 This is an easy way to make accents for TEN cards and FIVE tags with one sheet of 12x12 paper! This is a great class for anyone wanting to get started with making cards, embellishing scrapbook pages, finding new ways to use the beautiful Stampin' Up! designer series paper (like the ones in the Spring Fever bundle), or just making a BUNCH of cards you need! It's the IN thing to do! Don't you love the In Colors offered this year? It is exciting to be a part of such a dynamic company - Stampin' Up! obviously keeps up with current trends not only in product design, but in color choice. This is such a versatile palette that can be used alone or in combination with our other colors. I personally love the way Cool Caribbean looks with Close to Cocoa; and the trio of Cranberry Crisp, True Thyme and Sahara Sand is beautiful. What combinations do you like? The '07 In Colors are available in Classic Stampin' Pads, Ink refills, 8.4" x 11" card stock (as individual colors or as an assorted pack of all 6 colors), and 12" x 12" card stock (assorted only). Do you see what's missing?! MARKERS! I was so bummed that the fabulous In Colors weren't available as markers, until I went to Regionals! I learned an easy way to create my own markers using the In Colors classic ink refills. It's so inexpensive and works GREAT! So you can just imagine how excited I was to earn FOUR *FREE* stamp sets this week! As a Stampin' UP! Demonstrator we get all kinds of perks. As if it's not enough that I get to earn money having fun and doing what I love, I also get to earn free stamps! Have you had a chance to look through the Spring Mini Catalog yet? I'm putting my order in for all the Polka Dots & Paisley Bundles this Friday - be sure to let me know if you would like to place an order. I've got orders from several people and I don't want to miss anyone! You'll save a bundle during March with Stampin' Up! 's Spring Fever Promotion! From March 1 through March 31, you'll get 50% off any one item in the new Spring Mini Catalog when you purchase the Polka Dots & Paisley Bundle! Or you can host a workshop totaling $400 or more (before tax and shipping) during March and get 50% off any one item from the Spring Mini Catalog with no purchase required! Don't have the Spring Mini Catalog yet? Let me know and I'll get you one right away. Or you can view it online HERE. Give me a call or email today to schedule a workshop, class, or to place your order. You won't want to miss this exciting opportunity!